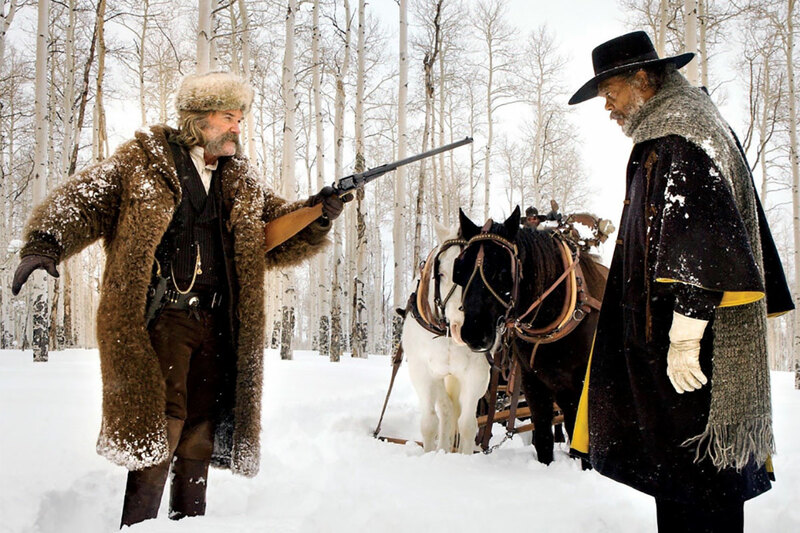 The Hateful Eight is now showing in selected Australian cinemas in 70mm and will have a wider release on January 21, and is distributed by Roadshow Films. Now showing in the United States and United Kingdom. The Hateful Eight has the unmistakable imprint of Quentin Tarantino's masterful film making with it's cleverly crafted screenplay and stunning, stylish cinematography married with unapologetic, intense violence. In post Civil War Wyoming, a coach makes it's way across the snowy mountain range with the intended destination of Red Rock while a blizzard is hot on it's tail. 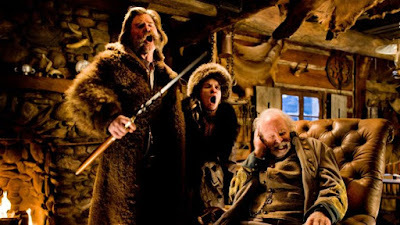 The four passengers are bounty hunters Major Marquis Warren (Samuel L. Jackson) and John Ruth (Kurt Russell), Ruth's prisoner and wanted murderess Daisy Domergue (Jennifer Jason Leigh) and Chris Mannix (Walton Goggins), who is to be sworn in as sheriff of Red Rock upon arrival. As the blizzard closes in, they decide to wait in Minnies Haberdashery till the storm passes to continue their journey. They do not find Minnie, but instead find a full house with Red Rock's hangman Oswaldo Mobray (Tim Roth), Mexican caretaker Bob (Demian Bichir), cowpuncher Joe Gage (Michael Madsen) and General Sanford Smithers (Bruce Dern) all waiting out the storm. The eight are all suspicious of each other and not one will hesitate to pull the trigger if need be. 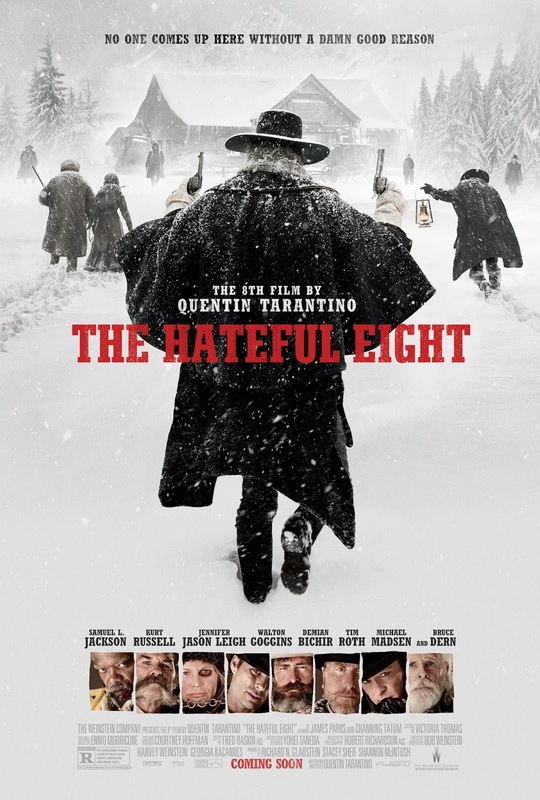 As the eighth film from the mind of the charismatic Quentin Tarantino, The Hateful Eight's screenplay is a thing of wonder with it's unique and original tale that combines the traditional western with a whodunit thriller. Like all good mysteries, it is completely unpredictable and suspenseful. The film builds suspense and intrigue over it's three hour and 7 minute running time (with overture and intermission included), as it is in the first half that the colourful characters are introduced in great detail and placed in Minnie's Haberdashery. After the intermission, tension is significantly heightened as this is when most of the action takes place and one gets a greater sense of where the story is going. The dialogue is particularly brilliant as it is incredibly well written, witty and rather hilarious at times. With the help of Tarantino's direction, the cast deliver this dialogue with conviction and character. As can only be expected from a Tarantino cast, each and every one of the featured actors gives a great deal of life to their character and makes them incredibly interesting and enjoyable to watch. Each of the eight who assemble in Minnie's Haberdashery has a great deal of character and although none are particularly likable or attractive characters, they are all terribly intriguing. Each actor gives their all to the character they portray and they all give fine performances. Jennifer Jason Leigh as Daisy Domergue is particularly a stand out. Daisy is absolutely repulsive and perhaps one of the most unladylike females to appear on the screen in recent years, but she is brilliant. The fact that she makes one feel so much disgust at her performance is a credit to her acting and Tarantino's direction. Walton Goggins gives an extremely interesting performance as Chris Mannix with his intriguing delivery of dialogue, as does Tim Roth as Oswaldo Mobray. Both characters are rather hilarious, but are subtly so and in a way that appears non-intentional. Set in freezing cold conditions, The Hateful Eight is visually exquisite as well as visually graphic and gruesome. The opening shot of a snow covered statue of Jesus on the cross is a sign of the blood shed to come and is rather unsettling for an opening scene, but turns into something beautiful as the camera pans across and then out to reveal the coach making it's way through the snow. These scenes in the snow are absolutely beautiful and are a contrast to the confronting visuals yet to come. The cinematography by Robert Richardson makes the film incredibly atmospheric and is supported by Ennio Morricone's superb score. However, like the Tarantino films which have come before it, The Hateful Eight will not appeal to those who are not fans of his mode of film making. As much as Tarantino is continuously praised for his stunning direction and wonderful screenplays in each of his films, his body of work is also notorious for it's graphic violence and explicit language. 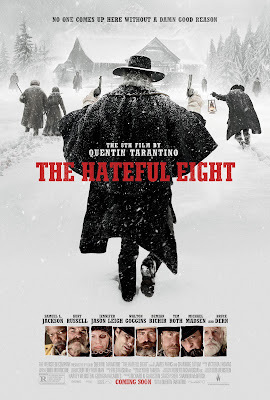 The Hateful Eight is absolutely no exception to this and is perhaps the most violent of his films thus far. Conservative group, the Media Research Centre tallied up 49 acts of violence during the film which include but are not limited to shooting, stabbing and torture. With the first half of the film being dedicated to character development and building the scene, the large majority of these acts occur in the second half. Some of these are rather unnecessary, but are so over the top that if they do not make one feel repulsion, they will make them laugh. Needless to say that those who go queasy at the sight of blood will not enjoy The Hateful Eight, but one does not expect a Tarantino film to be void of blood and gore and to expect it to be so is rather ignorant. The Hateful Eight is Quentin Tarantino once again pushing the limits of what some may perceive as shock tactics, but is really just what he enjoys building into his storytelling. Once one see's past the intense violence that takes place in the second half of the film, The Hateful Eight is an intriguing piece of cinema which is brilliantly written with superb cinematography and incredibly well-rounded, interesting characters.